This version does not yet support content that have been split up into multiple pages using the <–nextpage–> quicktag. Hot off the release of 1112 comes 1112.1 – I forgot to update the version number for one of the files. No other changes were made. Fixed: all anchors ending with “-2” when no headings were repeated. This was caused by plugins and themes that trigger `the_content` filter. The counters are now reset everytime `the_content` is run rather than only on initialisation. The TOC shortcode also supports the wrapping attribute with possible values: left or right. This lets you wrap text next to the table of contents on a per instance basis. Thanks to Phil for the suggestion. 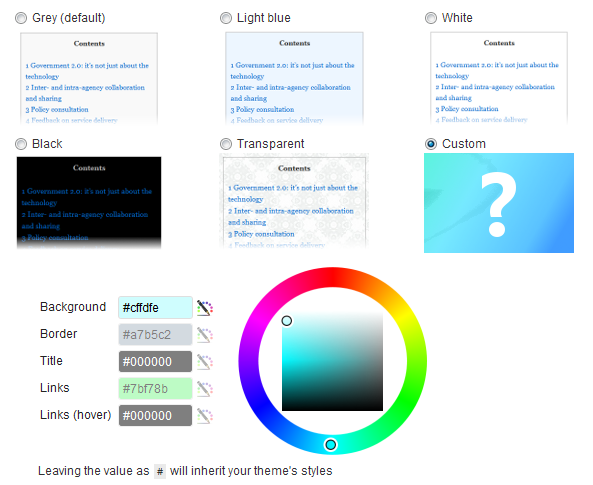 New: custom presentation option with colour wheel for you to select your own background, border, title and link colours. More on this below. Back to top functionality still hasn’t been added as I’m weighing up the different ways to do it. It will come… eventually. New: added shortcode to generate the table of contents at the preferred position. Also useful for sites that only require a TOC on a small handful of pages. There are no special upgrade instructions, so head on to the repository and grab your copy or upgrade automatically via the plugin interface.